You already have an item in your cart. Should it be replaced? You can set the flight date later. 695.00 EUR max. 3 Pers. Airport Mulhouse-Basel - Lörrach - Schopfheim - Rheinfelden - Liestal - Aesch - Muttenz - Birsfelden - back to the Airport Basel. There are local attractions overflown according to the weather and desires of the passengers. The route is dependent on the weather and of course aviation safety, otherwise the pilot attempts to fulfill your wishes in compliance with the flight time. With booking the whole helicopter you can discuss the route on the spot directly with the pilot. Exclusive Flight - Route and Schedule at its own discretion. The flight time is 30 minutes. The scheduling is done after purchasing a voucher/ticket. Flights from individual persons are held on weekends. Own Group flights (Exclusive - whole helicopter) are bookable at any time. Our pilots are pleased to advise you. You have the option with credit card, Paypal, prepayment or invoice to order. The validity of the value of the voucher is 3 years, which corresponds to the statutory limitation period. After the expiration of the 12-month Einlösefrist (on ticket indicated), the value of your ticket is valid for another 2 years. However, there is no longer entitled to redeem for the selected offer on your ticket. After 3 years, the value of the voucher expires. Vouchers can always be counted on other offers and be transferred to another person (subject to processing fee). Orders until 4 pm will be delivered on the same day by email or mail (payment receipt reserved). If your flight can not get made as scheduled, we will send the amount minus processing fee back. The value of the voucher or ticket can always be counted for another flight or location. Is your question not listed? Call us free on 0800 0700 130, because personal advice is important! The specified flight time and itineraries are indicative, these may vary according to weather, type of helicopter, wishes of passengers, control zones, no-fly zones etc. If you have any special requests, please discuss this with us in front of the flight or also directly with the pilot on the spot. Each helicopter is filled with 3-5 passengers depending on the location and helicopter type. Group flights operate only at the weekend (Saturday & Sunday). Schedule and route are fixed or on request. If there is a low demand for your selected flight, we may need to reschedule it. You book your flight on private basis with no other passengers. You can choose your own date (365 days), short notice bookings are possible, depending on availability. You can choose your own route. The dates will be directly with us or with the pilots on the spot agreed. Dates Group Flights: Usually bookable only on weekends. Events Exclusive Flights: Flight route and scheduling to choice on request. In bad weather, the flight is postponed, the voucher / ticket does not expire. Generally postponements must be expected. Please observe the following rules of conduct in your helicopter flight. Safety comes first. We gladly answer to individual questions from passengers. Also on the subject of fear of flying, we are available for helping. All flights are commercial flights and are subject to the guidelines of aviation safety authorities. 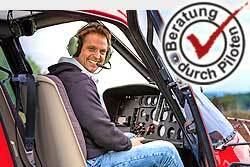 The dedication and commitment of helicopters have a passenger insurance for several million euros. We are aware of the problem of helicopter flights with the emission and noise levels and therefore do everything possible in order to counteract this. With us you can also make a additional contribution. To compensate for the same amount of emissions caused by your flight, in a sustainable climate protection project. (Can be selected during the booking process). If the flight is canceled from us and you can't make the flight on another day, we will refund the amount minus a processing fee of CHF 20.-. The glacier landing is made on a mountain airfield. Short term it can be, that due to security-related issues (wind, temperature, weight, etc. ), can not be carried out. The pilot is solely responsible. Alternatively it shall checked a landing at a restaurant. Die Robinson R44 ist die etwas grössere Variante des Robinson R22. Dieser Kolbenmotor Hubschrauber ist einer der preiswerten Helikoptertypen, und wird bei Rundflügen und Schulungsflügen eingesetzt. It is possible to use other types of helicopters. * Actual costs depend on your communication provider for calls to the german landline.